Set over the course of one school year, this is the story of two star-crossed sixteen-year-olds—smart enough to know that first love almost never lasts, but brave and desperate enough to try." Where to read: While angsting in your room, listening to your favorite band. 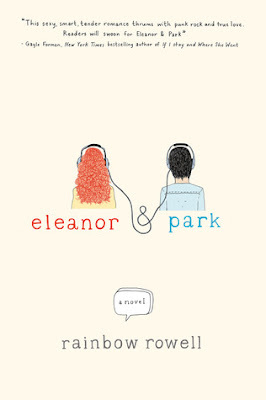 This book perfectly captures teen romance and angst. Is that a good thing? Yes. Does that mean I liked it? Eh. This had nothing to do with Rowell's writing, in fact she did a really good job capturing the feel of teenage emotions and insecurity. I loved that she incorporated music and comic books as a way for Eleanor & Park to bond and start their whirlwind romance. The feelings and love may have been quick after that however their teenagers, teenagers are delicate and emotional. Their hormones make them insecure about their appearance, which make them emotionally insecure which translates to romantically insecure, so when they find someone to bond with they immediately latch on, and I saw that in Rowell writing. It wasn't instalove, more like a quick love that rollercoastered. Honestly, I am just too old for the book to have any emotional effect. My favorite parts were when she incorporated music and comic books because I remember them from when I was young and knew exactly what she was talking about. Good ol' nostalgia. Another thing I like was that the ending was not predictable. On the first page it lead me to believe one thing, and I kept reading with the intention of the book turning out a certain way, but it didn't and I like that. While it did mention some racial issues, which Park being Asian American during the 80s and all, it seems like she sugar coated what could have been a really been something big. I am a product of a Bi-racial relationship so I know the tensions that can come with a relationship like that, add on bullying and the other issues presented in this book and wow this could have turned into something supremely meaningful. I can fault Rowell however, since can authors really completely understand and writing about things they have not encountered in their life?